Somehow, in the midst of a discussion on my Facebook wall this week about chicken-fried steak, a splinter cell debate over Luby's formed. 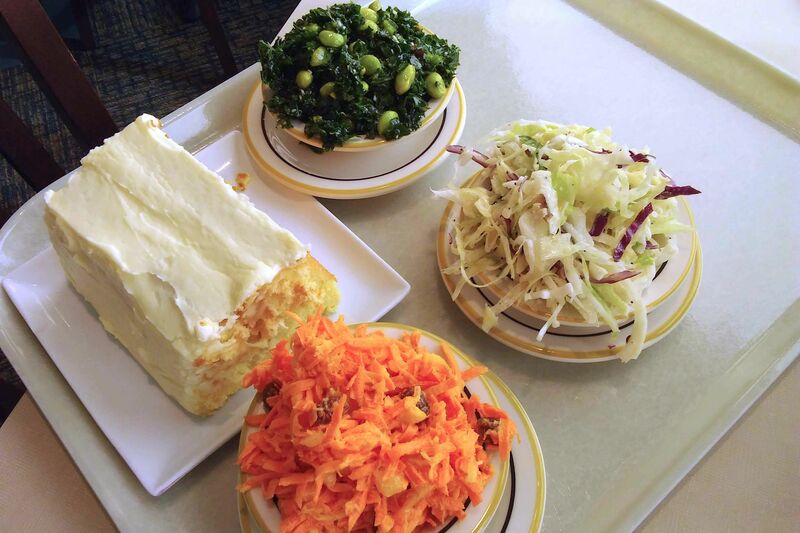 "Luby's is geriatric chow," one friend blasted. "Might as well just get Sysco to deliver blandness to your house." "They get all the elderly because they offer [a] 20 percent senior discount," another friend added. "Kinda pricy for the rest of us." But Luby's—which opened its first location in San Antonio in 1947 and was taken over by the Houston-based Pappas brothers in 2001—had its defenders, too: "I'm not so quick to brand Luby's as 'geriatric chow' or similar unflattering terms implying it's only for people old enough to remember black-and-white TV and pinball machines that went ding-ding-ding," offered my friend Shawn Quinn. "I eat there maybe once every couple of months or so. I think Luby's has done a pretty admirable job of staying up to date, pretty hard to do since cafeterias in general have kind of been on the decline." I'm a Luby's defender too, and for the same reasons as Quinn. If you grew up in Houston, you grew up eating at Luby's—whether it was after church on Sundays, on evenings when your mother didn't feel like cooking a meal, or at family get-togethers. Cafeteria-style dining is ideal for these occasions: everyone in your party can be accommodated; there's something for even the pickiest eaters on the steam table line. You don't have to worry about waiters getting everyone's order straight. There are specials for seniors, for kids, for people named LuAnn (okay, not really, but the Luby's LuAnn platter is famous enough to have merited a character named for it on King of the Hill—reason enough for any Texan to have a soft spot for the cafeteria chain). And while many cafeteria chains have, as Quinn mentioned, experienced a signficant decline in the past few decades, there's still a place in the world for Luby's. Piccadilly filed for Chapter 11 bankruptcy in 2011. Furr's gave its cafeterias modern overhauls—now called Furr's Fresh Buffets—yet the food is still one step above MRE fair. Cleburne Cafeteria, which is celebrating its 72nd anniversary this year, is still good—but there's only one of them. Luby's, however, can be counted on. 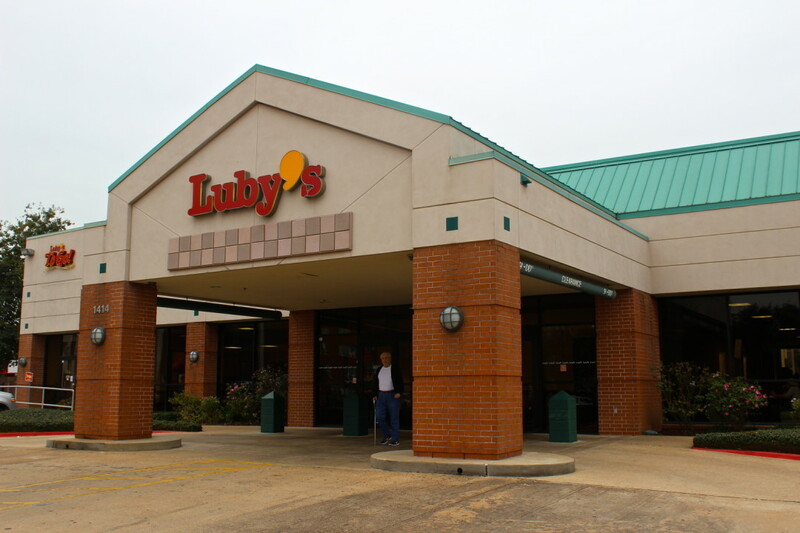 Although the chain closed 25 of its stores in 2009 to cut costs, there's still a Luby's relatively near you. And more importantly, it's not the Sysco slop you may believe it to be. 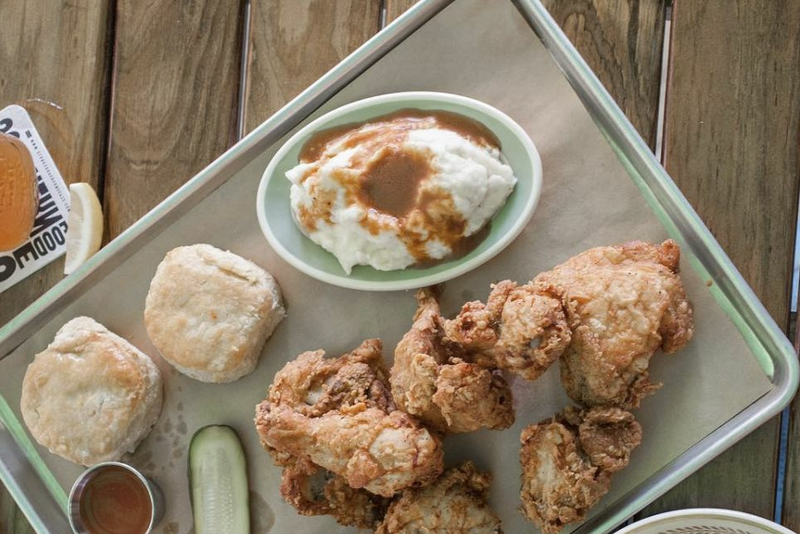 "We don't buy from Sysco actually and take pride in our chicken-fried steak and chicken," among its other dishes, points out Elaine Mesker-Garcia, social media manager for Luby's and its sister restaurant chain, Fuddrucker's. As long as I've known Mesker-Garcia (which is for at least five years now), she's raved about the fact that Luby's still makes everything from scratch in its kitchens daily. They're even happy to arrange behind-the-scenes tours for anyone interested in witnessing how the the famous Luby's macaroni and cheese is made first-hand. "Luby's may not be a hip, gourmet place," admits Mesker-Garcia, "but we do serve some basic classic dishes and it's a great place to get some comfort food that is familiar." And this final argument is why I always land at Luby's. 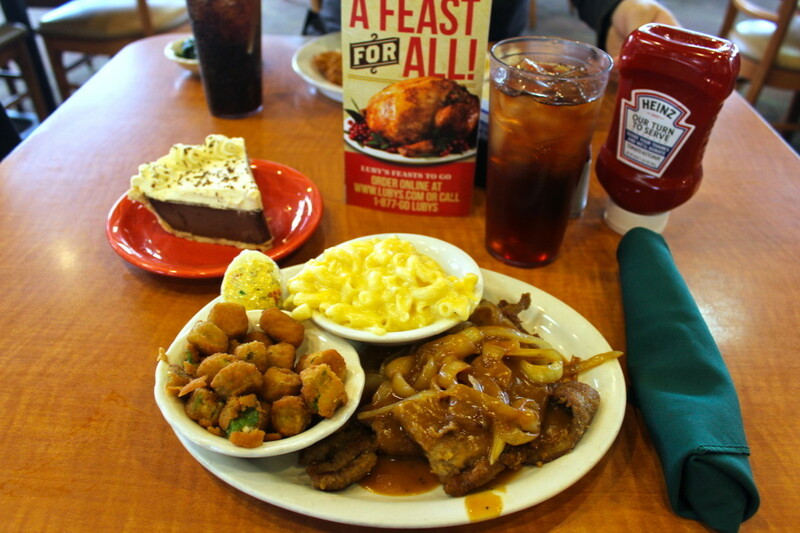 When I want a heaping portion of perfectly-cooked liver and onions—a decidedly old-school dish that's tough to find these days—with a side of creamy mac 'n' cheese and fluffy, crispy fried okra, there's nowhere else I'd rather be than at Luby's. Which is exactly where I ended up for lunch earlier this week, an iced tea and a deviled egg on the side of my plate rounding out the fully Southern feast. 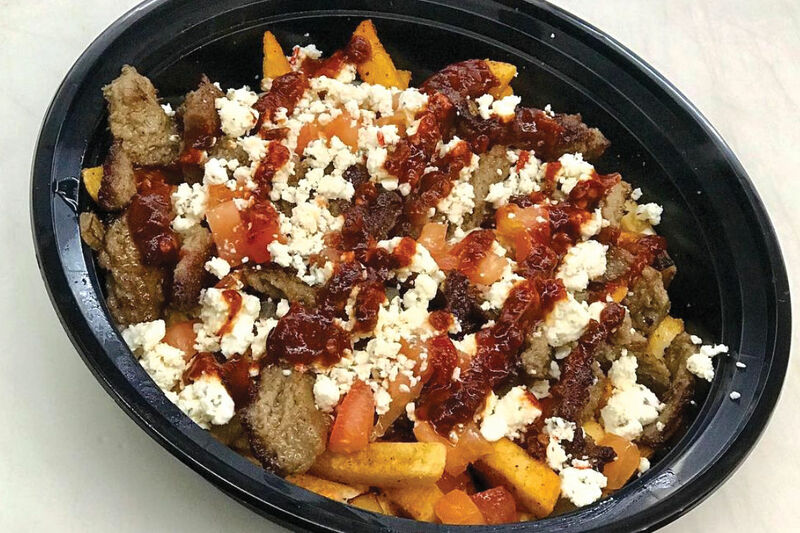 Every bite was as good as every bite before it; that's the beauty of Luby's—especially at a time when so many restaurants struggle with consistency. I've never had a bad plate of liver and onions here. The liver is always well-battered and fried to a nice crisp, never overcooked and always topped with sweet onions softened to the ideal point that comes just before full-on caramelization. The mac 'n' cheese tastes the same each time; the fried okra too. 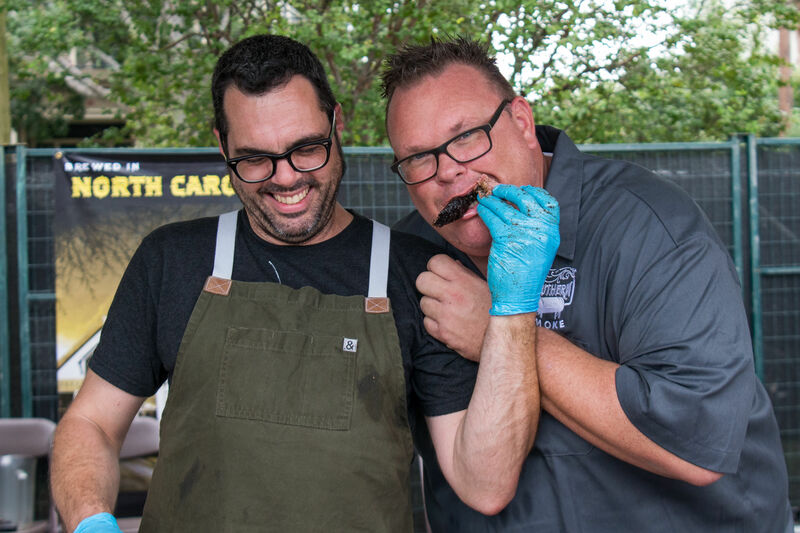 And while I'm often at my happiest when I'm dining on the edge, seeking out the weirdest or hottest or most adventurous foods possible, I appreciate the comfort that comes from a simple, well-prepared meal of familiar favorites. Luby's is like putting on a comfortable pair of fleece pajama pants after a long, cold day. It's like putting in Young Frankenstein after a tough, demanding week and laughing at the same old Mel Brooks jokes you've laughed at for years. It's like getting a hug from your mother, something you'd never turn down no matter how many hugs she's given you before. So what if you're surrounded by gray-hairs while you eat? At least you're eating your macaroni and cheese in hard-won peace and quiet.